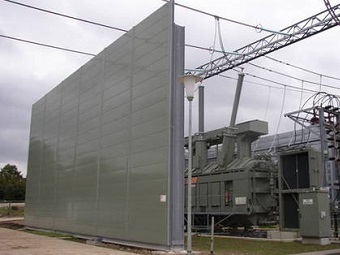 The sound barrier wall is an engineered modular sound panel system designed for high sound reduction of outdoor noise control. 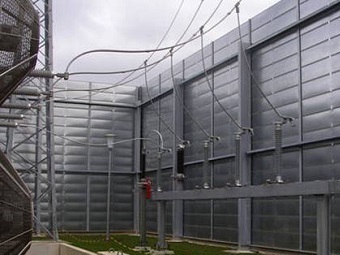 The barrier wall is typically used outdoor to control mechanical noise, transportation noise and other disturbing noises produced by chillers, fans, transformers, compressors etc. 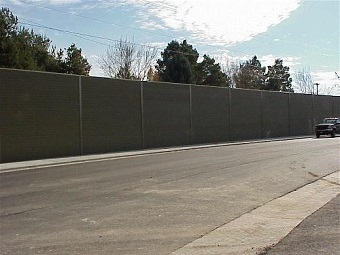 Our engineered sound barrier walls are specifically designed and constructed with environmentally durable composite construction that absorbs sound energy and blocks offensive noise. Modular Sound Barrier fabricated from 18SWG GI sheets, Galvanized coated Perforated Sheet Modular Construction duly seven tank pretreated and powder coated, having rock wool in the form of slabs of 100 mm thickness and 64 KG/Metric cube density (Specification of Rock wool conforms to IS 8183). Complete with foundation and support from floor. The sound control system designed to suppress sound levels upto 15-20 db maximum at 1 meters distance. Vehicular traffic noise in case of highways, flyovers etc. How long does it take to get sound Barrier? Under normal conditions, we will manufacture and ship materials within 4-6 weeks from receipt of a Purchase Order or Deposit. How tall does the sound Barrier need to be? Ideally, and Acoustical Engineer will advise on the optimum height for the barrier. 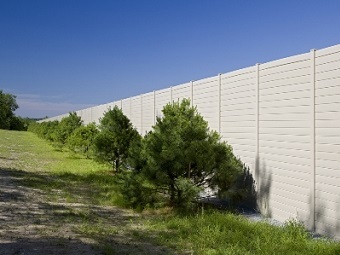 A basic rule of thumb for barrier height is: Any noise barrier should be at least as tall as the line-of-sight between the noise source and the receiver, plus 30%. So if the line-of-sight is 10' high, then the barrier should be at least 13' tall for best performance. We will be happy to provide input on such matters, as well as refer you to a local Acoustical Engineer if desired. Where should I place the sound Barrier? Again, such matters are best left to an Acoustical Engineer to determine if possible. 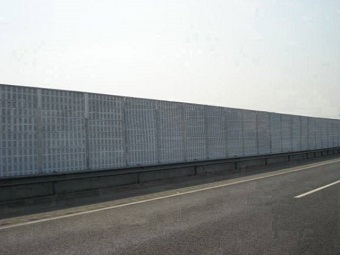 Generally speaking, a noise barrier should be as close to the noise source as possible, while allowing for suitable access and air flow for the equipment. We will be happy to provide input on such matters, as well as refer you to a local Acoustical Engineer if desired. .
How much does the sound System cost? 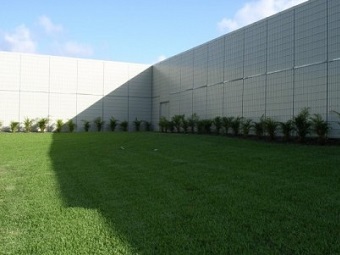 The sound System is cost-competitive with other high-performance noise barriers, and is priced on a square-foot basis. Current pricing for the LSE System averages from Rs: 1000/ - 1300/ per square foot for materials delivered to the jobsite in Mahrashtra (delivery charges apply to destinations outside the state). Pricing is based on final layout design and wind loads. Our pricing includes all engineered structural steel (hot-dip galvanized after fabrication, all sound Panels and Top Caps, and detailed layout & installation drawings. Our pricing does not include installation. The primary considerations that influence pricing are barrier height, wind load and any options desired. Once we have the pertinent details of any application, we will provide a detailed Quotation for Customer approval. What colors does the sound System come in? The sound System can be made in any color, as well as custom-color match. Since the color pigment is incorporated into the HDPE shell during the manufacturing process, it will not scratch, flake or peel like topically-applied finishes, and never requires painting. Will the sound System work for my specific application? The sound System attenuates the most common noise frequencies associated with outdoor noise sources. There are a few, very low-frequency noise sources that are difficult for any barrier to mitigate, but these are not common and SFS will advise our Customers if this is the case. Can I use the sound System for indoor applications? No. The sound System is designed exclusively for outdoor use. Do animals eat or build nests in the sound System? No. The sound System is specifically engineered for outdoor use. Each sound panel is designed to shed moisture, and each is independently self-draining. Additionally, freeze-thaw cycles do not destroy the panels or their contents. Does rain or snow affect the sound System? How long will the sound System last? There are sound barriers that have been in the field as long as the company has been in existence – 40 years or so – that are still performing acoustically, so it would be safe to say that they come with a long shelf life. What kind of noise reduction can I expect with the sound System? The sound System is considered to be one of the best-performing outdoor barriers in the world. Generally speaking, the sound System will provide 15-25 dBA reductions from one side of the barrier to the other in commercial applications. Since there are many mitigating factors that influence attenuation performance in outdoor applications, however, exact performance is difficult to predict. If you need to meet specific dBA levels, we suggest you contact an Acoustical Engineer since they are trained to make such predictions. Soundproofing India will be happy to provide input on such matters, as well as refer you to a local Acoustical Engineer if desired. Can the sound System be replaced if damaged or removed? Yes. Should any of the sound components be damaged by outside sources, they can easily be replaced by removing damaged panels and replacing them with new ones. Also, the entire sound barrier can be disassembled and removed should that ever be desired.